I highly recommend the new version as it’s much more streamlined, but keep reading for the old version. I've been touring with bands for about 4 years now, and my workflow has changed nearly every tour, allowing me to spend less and less time editing, and ending up with an organized, easy to manage body of work after each tour is done. I think this is crucial to not only the quality of work you can put out on tour, but also your sanity. My workflow as it is currently allows me to deliver 50-150 edited photos per day, delivered to my band & crew, in under an hour. Before anyone goes to bed I want them to have photos in their Dropbox. The more time that's taken out of my day to deal with my workflow is less time I have to shoot, relax, or work on other things. I have heard of multiple photographers being fired from tour gigs because artists either never see photos, or they take way too long to deliver them. 99% of tour photos have a 24-hour lifespan. A photo from last night's show is relevant, a photo from 3 shows ago really isn't. 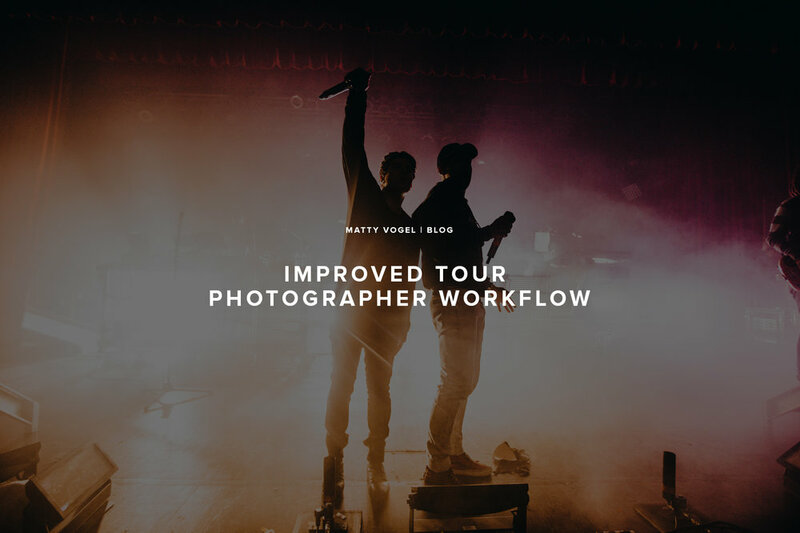 Since posting my tour photography workflow nearly 2 years ago, I've changed a few things about my process and wanted to publish an updated version of what I do, as it's always improving. Dropbox or another cloud storage system. 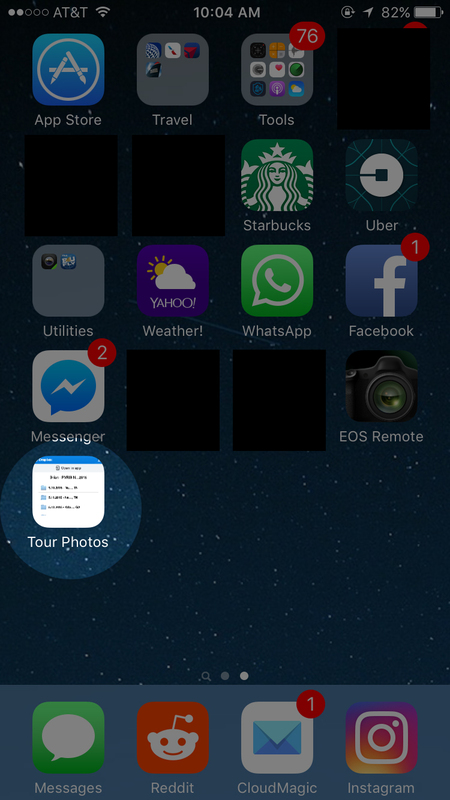 Create a parent folder for the tour, and then sub-folders for each date. Here's an example below. One big change I've made is migrating from daily Lightroom catalogs to one for the entire tour. First, create another sub-folder within the above parent folder to house your Lightroom Catalog, name it whatever you'd like. Create a new Lightroom catalog and store it within that folder. Mimic your folders you just created as new collections within this Lightroom Catalog. If you haven't used collections in LR before, take a minute to do a quick Google search, as you'll find plenty of information on this very simple system. The downside of a single catalog is that if you're making a daily backup of your files (and you should be), you have to make sure you overwrite the old catalog, otherwise your day's edits won't be saved. Also, if the catalog is corrupted, deleted, or damaged somehow you would have a big problem. Thankfully if you are regularly backing up this shouldn't be an issue. Day one has a little extra preparation to make your workflow the rest of the tour go smoothly. Depending on the size of the tour you're on, the lights will likely be the same each day. Even if it's a smaller tour without its own lights, you will want a consistent look across your work for the whole tour. Okay, my workflow process usually starts at the end of the day. It's 11:00pm or so and the show is done, and I've packed up most of my gear. I can usually finish this entire process in 60 minutes or less. I go through photos one-by-one, usually giving them about 1/2 of a second to determine if it's trash. If it is, I keep going. If it looks redeemable, or it's too dark to see well, I'll up the exposure or other settings quickly to determine if it's worth keeping. Once I've gone through everything once, I'll go to Library view and filter by attribute > 5 star rating. Now I'm only working with all my keepers. I use Dropbox because I find it's the easiest for delivery, most musicians I work with already have it set up, and know how to use it. The last they thing should have to worry about is figuring out how to access the pictures I'm hired to take for them. I often deal with some band or crew members not having enough space on their Dropbox account for all the photos - there is an easy workaround! You're storing them all on your plan anyway, so the only space you need is your own. I'll show you how. Click the blue "Share link" button on this page. Click "Add to Home Screen" button, and name the link. I open up my just created "Web" folder for the day, filled with the images I just exported. I copy and paste photos of each person into their own folder. I usually shoot 1,000 - 1,500 photos every day. This means my RAW files alone from one day can amount to 40gb or more. Each tour's backups can amount to over 1tb each. That adds up quick on physical drives, especially when keeping redundant copies. I used to keep every RAW file that I shot, but I have stopped doing this on tour. I've realized that when I reach into my archives, I'm only accessing photos I've delivered in the past. I've kept them in case of ever needing to pull more images or options for certain shows, but I trust my culling and eye to find the best images when I go through them each day. Clients will never ask for an image from the past that they haven't seen, so what's the point in keeping them all? After I deliver photos each day, I go into Lightroom again, and sort by Attribute > Rating = 0. I select all of these images, and since they're my throwaways I delete them, including "Delete from Disk" to get rid of the original RAW files. Note that you cannot be looking at the photos within a collection when you try to delete them, otherwise you just remove them from that collection. I don't have an internal hard drive big enough to keep all of my work locally on my computer, so after I back up on both of my hard drives, I will delete old daily folders to open up space. Don't skip this step! It's important. Many things can happen to your data, especially on tour. I've seen people drop hard drives from their bunks, bags get stolen, and drives just straight-up stop working. Don't let something like that cause you to lose all your work, you can prevent it. I've never had consistent enough good internet to make cloud backups on tour a reality, so I rely on portable hard drives. Since I've started deleting my throwaway RAW files on tour, backing up has become even easier. Transfer rates and space issues are much easier than they used to be for me. My most recent 30-day tour resulted in the folder's total size, including high resolution exports, RAW images, and a Lightroom Catalog as 162gb, which is entirely manageable. As soon as I get home, I go through my full-tour Lightroom catalog and export everything into a "High Res" sub-folder. These are full-size jpgs at the highest resolution possible. These "High Res" sub-folders are used for pulling images from my archives down the line for magazines, prints, merch designs, my portfolio, or anything else my clients need them for.